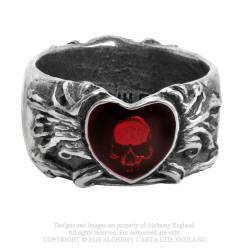 A sumptuous and wide-ranging collection of darkly exotic, extreme and bizarre jewellery and fashion accessories and giftware, skilfully hand-made by Alchemy England. 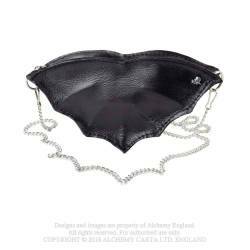 Alchemy’s products are unique in the world and make the biggest and most creative and varied range of alternative lifestyle jewellery, accessories and giftware in existence. Every year we introduce at least four new collections to our catalogue, amounting to over 150 new pieces, setting the standard for design and innovation, with our License partners adding many more times that to make the possibilities infinite - always fresh and in front! Alchemy lead, the rest follow. All of Alchemy England’s pewter products are individually designed, modelled and developed in England by the Alchemy Studios creative art and design team. Each individual product is then hand-made with pride from the finest English Pewter by Alchemy’s own highly skilled craftsmen, all at their studios and workshops in Leicester, England. 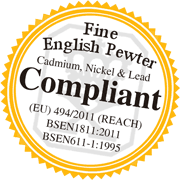 English Pewter is the finest grade of pewter, (to BSEN611-1:1995 standard). Traditionally, pewter was a mixture of lead and tin, but today, English Pewter is a rich, high-grade alloy of 92% tin with copper, (plus a few legitimate trace elements), and is regarded as a ‘semi-precious’ metal valued second only to silver. For jewellery, this is the safest tin-based alloy in use and is lead, cadmium & nickel compliant. English Pewter is very much harder to craft than zinc alloys and the old and primitive forms of pewter, which contain significant amounts of toxic impurities which ease production, however, these poor alloys are still used by many manufacturers around the world today. Also, beware of imitation 'pewter', which is often substitute in inferior fashion jewellery, usually made from a much cheaper, hard, zinc alloy plated to look like pewter, and which is lighter and extremely brittle, breaking very easily. 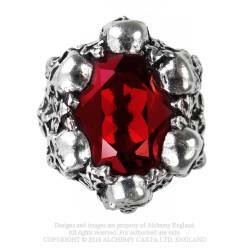 Alchemy uses mostly the highest quality Swarovski Elements, crystals and genuine polished cabochon stones when enhancing their jewellery and accessories. By contrast, imitation pewter jewellery is usually decorated with plastic fake 'crystals', despite their sometimes deceptively convincing appearance in images. Alchemy never use 'plastic crystals’. Subjects covered in Alchemy's various products include bats, skulls, amulets, crosses, crucifixes, skeletons, pentagrams, runes, axes, daggers, stars, dragons, claws, angels, moons, keys, ankhs, Thor’s hammers’, wolves, ravens, crows, roses, ivy, blood, steampunk, alchemy, Alchemist, hearts, wings, demons, devils, gods, horror, chalices, spiders, fangs, vampires, werewolves, witches, snakes, serpents, seals, fairies, thorns, absinthe, Poe, Victorian, gothic, metal, cogs, pistons, priests, Latin, good & evil, dark & light, tears, reapers, aces, luck, ink, talismans, pirates, blades, chaos, horns, sigils, bones, rock 'n' roll, guitar, punk, tarot, past & present, pagan, male & female, history, Renaissance, Celtic, Catholic, Hebrew, Jewish, Viking, Saxon, Norse, fantasy, German, British, heraldry, druids, magic, esoteric, prediction, zodiac, astrology, exorcise, Cabbala, John Dee, Elizabethan, Mediaeval, Middle Ages, Dark Ages, chains, dungeons, castles, torture, tattoo, gambling, poker, dice, cards, aces, razors, poison, webs, swallows, scrolls, love, hate, bikers, flies, spines, hangman, noose, death, hot rods, scythes, funerals, graves, cemeteries, eyes, guns, hands, shields, rams, vials, crystals, mirrors, velvet, ribbons, lace, mystical, mythology, Fleur de leys, twilight, gemstones, emeralds, bridal, weddings, marriage, engagements, 8 balls, ink, inked, secrets, regal, royal, prophets, night, Eve, vamps, burlesque, passion, sapphires, rubies, diamonds, Wicca, Wiccan, antique, stars, role play.